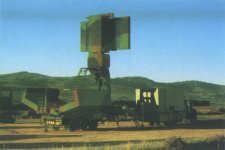 The 3D radar system DR 174 is a highly mobile short/mid range surveillance radar operating in the L-Band. The radar system can be used as coastalradar for sea and air surveillance or as “gap fillers” for areas longer radars do not cover. The system can be integrated into existing defence networks, anti-aircraft (AA) weapon systems and other networks. It can also serve as a “stand alone” control center due the fully integrated state of the art working positions. A wide range of ECCM features and excellent clutter suppression ensure the detection of small targets even in a very hostile enviroment. This 3D radar system operates in L-Band using a stacked beam active planar antenna. It features up to 8 elevation beams on receive. The system is designed in fully solid state technology. The detection range against tactical aircrafts (“Swerling 1”- targets) with a radar cross section (RCS) of 1 m² is 135 km at a probability of detection of 90%. The detection range against tactical ballistic missiles with a radar cross section (RCS) of 0.1 m² is 75 km at the same conditions. The system consits of four major components the sensor (antenna group consisting of primary ans secondary radar), the Signal Processing (SiP) shelter, the Operations and Missions Control (OMC) shelter and the generator for reliable power supply in mobile deployment. Also available is the DR 184, the long range version (400 km) of DR 174.